Who said planning is the fun part? When I first imagined what RVing would be like many years ago, I pictured an idyllic ramble around the country, taking my time, staying wherever I felt like staying for as long as I wanted, and just picking up and leaving when I felt like it. That might work in the desert southwest now and then, but not so much for a three month sojourn through Texas and Florida and back, during prime season. In the midst of all the other doings around here, I have been trying to get a handle on those plans. Usually I like this part, and open up the various apps that Nina discussed so well in a recent post, start up my old copy of “Streets and Trips 2011”, open up Google Maps and my Google Calendar, and start planning a route. Even for our trip to Alaska, this was a fairly straightforward process. We didn’t even make reservations for that entire summer on the road. Florida in February is a completely different story, and as Sherry warned me, I should have started six months ago! I not only have to plan a route, I have to know EXACTLY when I plan to be in any particular place and make real honest to goodness reservations. Ack! How in the world can I be sure that I’ll be in Chiefland, Florida on a specific date when there are many months and thousands of miles between me and that date? I have dreamed of a winter in Florida with my kayak in tow ever since I started visiting Bel in Ocala back in 2000. 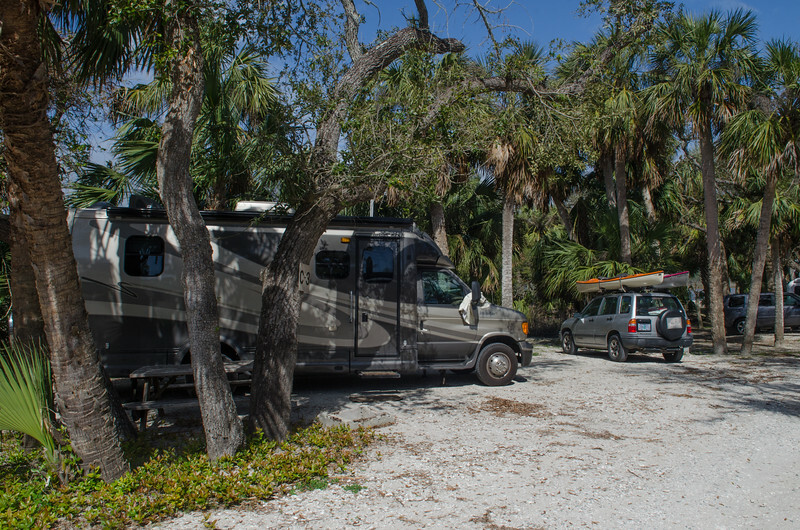 Mo and I got our boats to Florida on our cross country trip in 2007 for one magical float on the Silver River before we trundled on back west to buy the new motorhome in Texas and continue toward home. I have read the blogs avidly, ‘pinned’ campgrounds and rivers and events, and they created the beginning of my google map. The problems only begin when I try to link them all up, figure out the route and the miles and the DATES…and then make reservations. Only by now, I have been working on this for a few months, and I am too late for some of the places I wanted to go! Yup. Sherry was right. I should have started this six months ago, but somehow I was too busy TRAVELING then to be thinking about what I was going to be doing in 2014. Before I go into the ‘plans’, I want to remember the fun things I have been doing NOW. Would you eat dinner in this place? We did, and it was a fantastic experience. The Cowboy Dinner Tree used to be just that. It was a big old juniper tree out in the Oregon Outback near Silver Lake where they parked the chuck wagon for the cowboys. It has evolved a bit, and now people come from who knows where to fill this place up every weekend. Reservations required, two choices: chicken or sirloin. Dinner comes with salad, rolls, bean soup, potatoes, iced tea or lemonade (oops another choice) and dessert. It isn’t cheap, and it takes two hours to get there. We rode with some local Rocky Point friends so the distance was irrelevant, and the experience was priceless. It is a “thing” and I am glad we took the time to do it. Although I brought the completely ridiculous steak home and made fajitas two nights in a row and then two more dinners from the chicken. Sheesh! This week was bittersweet in a good way. I worked the very last time for soil survey. Sequestration and budget cuts and no federal budget all combined to end my contract career, so I retired for the second time. So I am really really retired now. Completely. It makes for some nice travel time, and is the reason I can manage to be off work long enough to take off next winter for three months instead of just a few weeks at a time. I’ll be poorer, but richer in time. I am pretty sure it is a good thing. Another delight this week was a visit from Vermont friend Jeanne, (yes the famous adventure woman, Jeanne, that I have written about before). Only this time she brought along her sweetie, Alan, and he won Jeremy over in about two seconds and won me over about two seconds after that. Jeanne, you done good!! As did you, Alan. A pair made in heaven, or as all Jeanne’s friends say, a Danielle Steele novel. It is just romantic beyond imagination. He is a forester, she is a botanist, they both had basically given up on finding a soul mate, and they met in the woods at work! Isn’t that just incredibly perfect?! We were on the water by 7 with beautiful partly overcast skies, perfect water, and lots of birds. Jeanne and Alan planned to see Crater Lake later in the day, but weren’t in too much of a hurry to miss out on pancakes and bacon for breakfast before they left. After all the smoke that has been here, I was so glad to see perfectly clear skies by the time they got to Crater Lake, blue and smoke free and gorgeous. At least on the web cam. I had to keep checking to be sure that Alan’s first view of the lake would be wonderful. Jeanne wanted to show him all the cliffs she used to ski down when she lived here. Crazy woman. Now back to the planning thing. Which is pretty much how that planning thing has been going. I work on it awhile, then something comes up and I get back to it later. Which is why I missed out on Myakka Springs and a couple of other places I wanted to see in Florida. Completely Booked!! We did manage to have a conversation with John and Carol from Our Trip Around the Sun who are going to be at Ding Darling Refuge on Sanibel Island and yes, I arranged a day, at 7 in the morning, when we will meet for a refuge trip that will hopefully turn up some spoonbills. Big on my bucket list. And yes, I have planned that specific day and specific hour from 3500 miles and six months away. I know, I know. I have no right to complain. If you haven’t read Erin’s post about her plans for the next three months go check it out. That is planning on an Olympic scale! I think they have so many vacations nested in their vacation that it reminds me of those little Russian dolls. Ours will be just a bit simpler. We only have a simple vacation with a cruise vacation buried in the middle there somewhere. We will amble through California, Arizona, New Mexico, and into Big Bend country in Texas, wander off to the coast at Port Aransas where I will get to walk the beach with Erin and watch her with that famous camera! We will continue east toward New Orleans, where we will take a 9 day break for a little cruise to the Western Caribbean, and after returning we will amble off to Florida for a month of kayaking and beaches. There is a saying about Florida, “I came for the beaches, but I stayed for the rivers”. Ahhhh. We will go as far as Key West, then amble back up the coast. I have mostly reserved everything along the way. I think we will be in Blue Springs on Monday morning, March 3, at 10:02 AM. Or something like that. I know, the best laid plans can be severely disrupted, and I am trying to accept that with equanimity. Still. Those reservations are all prepaid, for Pete’s Sake! When we leave Blue Springs a few days later, I have no plans except for going north and west. I have no reservations. I have lots of blog posts about COE campgrounds and great places to see along the way, but we are going to actually stay loose during this part of the trip. For the month of March, we will just move gradually west and north toward home, following whatever route the weather and our mood dictates. I’ll let you know how that goes as well. It is so great to have Deborah here to house sit for us while we are gone. She wants to keep the home fires burning and I’ll leave my truck with her so she can get back and forth in the snow. We will be bringing Abby, but I have decided to let Jeremy stay with Deborah for the trip. At least for now that is what I have decided. I’ll let you know how THAT goes as well. Sigh. Lots coming up. More to tell, but this post is entirely too long so I’ll save it for later. Next: MoHo interior renovations and we are soon off to the far northeastern part of Oregon! Waking early Wednesday morning, I looked out over Medicine Lake, smooth as silk, without a ripple anywhere. The skies were clear and only a faint bit of smoke remained on the eastern horizon. Our days of doing nothing were about to begin with a meandering 3.5 mile loop around the perimeter of the lake. Our campground site is at the upper mid right of the map above, the swimming beach is the far right marker, the best fishing hole is on the lower left on the lake and the Brownell Cabin in on the lower bottom left on the shore. The good bike trail goes to Little Medicine Lake on the upper left shore. Somehow slipping into a kayak in the early morning feels like nothing at all, no effort, just a silky glide across water so clear I can count fish and silence only broken by the cry of ospreys. I don’t know how long we were out there that first morning, maybe a couple of hours, but by the time we returned to camp the wind had picked up a bit and the smoke was disappearing completely. The day began with french press coffee and tiny donuts before we went out on the water and waiting for a mid morning hearty brunch seems to work best for us on this kind of trip. The day would have continued without much fanfare, but as we settled onto the beach for a bit of sunny doing more nothing, our neighbor approached us all full of conversation and questions. She wanted to know where we were from, where we got our kayaks, and if we wanted to join up with their kayaking group from the Medford area. Martha was a very gregarious, talkative, and friendly woman and by the time she left, we had exchanged emails and had plans to contact each other for a day on Recreation Creek. Not long after that conversation, she and her friend pulled out of the site just next to us, number 43. Earlier, when we found out they were moving, I asked Mo if maybe we should relocate, and she said, “No Way! !” But after they left, and we walked over to the site, the very easy, not steep, and not rocky path directly to the beach from the camp spot changed her mind. Ok, let’s do it! Within minutes we pulled in the slide and backed the MoHo down the 50 yards or so to the much bigger, much more level, much more private site even closer to the lake. The funniest part of all was later when I was reviewing my photos, I realized that we had camped in this site back in 2005. How could I forget?!? Rather than hooking up the trailer, we just rolled it down the hill by hand to the new site, and floated the kayaks over to their new beach.. So much for doing nothing! After getting all settled in again, I had to run around in a flurry trying to take photos of the new site to remember why we made the move. It was a great plan and for the next several days we said over and over how happy we were that we didn’t have to get up and down that rocky trail to the beach from 45. Funny, I think I remember saying yesterday that 45 was such a great site. Well, it is, but only if you can’t get into 43. A bit later we were down on the beach again when another woman came up to us asking questions about the boats and our rig. Seems as though she and her husband were camping and were hoping to eventually retire and buy a small motorhome of some kind. Before long we discovered that her husband was the base commander at Kingsley Field back in Klamath Falls and she was some kind of retired air force officer who now had three kids. I swear this woman didn’t look a day over 35. I guess some people make all the right choices at the right moment. She talked about her travels in the world, her husband, being active duty parents, and all about how much they loved living in Klamath Falls. People in campgrounds are just so incredibly friendly. It wasn’t long afterward that another couple moved into our vacated site 45, only they at least were camping with a tent. Next thing you know, they are coming down the trail asking about the kayaks. They were from San Francisco, at least that is what they said at first. When we responded with “Oh, where in San Francisco?” she said, “Pacifica”. Then when Mo said she had taught in Pacifica for 25 years, they started talking about driving Devils Slide and the new tunnel, and then it came out that they actually live in Montera, just a few blocks away from Mo’s ranch in Montera where she lived for that 25 years while teaching. We all laughed about how you just say “San Francisco” to folks you assume won’t have a clue where Montera actually is located. How does that happen anyway? It turned out that Barbara and Ansel were a highly entertaining couple, with some crazy quirks and a LOT of stories that they liked to tell with gusto. They also had a brand new inflatable kayak and were fairly new kayakers and wanted some advice about where to go on the lake. By this time it was very windy and there was no way anyone was going out on that lake in a kayak. We knew there was a small window of quiet usually in the morning for silky boating and told them to be up and on the water by 7 if they wanted to take advantage of it. We spent the rest of the day doing our usual nothing, which includes some reading, some sitting and watching the sky, throwing balls for Abby in the water, watching the lake, and eating. We used the Weber Q for our suppers and the days just seemed to run all together. I had taken the computer with me, thinking that I could at least write for the blog with the inverter or when the generator was on, but sure enough, I had forgotten the plug! I am having to remember all this several days later since writing with a pencil is something I just can’t seem to do any more at all. I didn’t even take photos for two entire days and the only way to remember what we did is to go back over the photos. We kayaked every morning and some evenings, had a big campfire every night where I roasted marshmallows and filled them with little pieces of chocolate that would melt perfectly. We had great dinners, and wonderful big breakfasts that were closer to lunch and never bothered with lunches the entire time. We went for short hikes up to the Glass Flow, rode our bikes up to Little Medicine Lake on the lovely bike trail. We tried to ride to Arnica Sink on the not so lovely bike trail that was deep sandy pumice mined with fat lava rocks. We turned around on that one and decided that riding on the road was much more fun. The birds are always a highlight, and after a few mornings I actually recognized the two blue herons that flew from shore to shore. It is always a decision as to how close to get, with the rule being if the bird is uncomfortable and starts to look nervous, you are too close. I think I got too close to these herons. I felt guilty, and then would think, well maybe if I am really slow and still it would be ok, but it wasn’t, they flew away, and dang! I need a longer lens. The lake is populated with at least a dozen ospreys, perched on snags on the east and west shorelines and always entertaining with the diving and fishing. We also saw one bald eagle on the west side one morning, and a couple of red tailed hawks and another hawk that I couldn’t identify. I was surprised to see several vultures as well, as I don’t remember seeing them at this kind of high altitude before. There was one Great Egret in the meadow on the first morning, too far for a photo, and he wasn’t there again. Ducks were surprisingly few, with just a little group of young ones without a mother paddling along on the east side of the lake. Mo and I don’t fish, but we had a great time searching for fish in the clear water, with some great success along the southwest shoreline where one of the springs comes up. Sometimes we could see six to ten trout, maybe 14 inches or so, swimming around beneath us. We also love paddling into the knotweed with the happy pink flowers standing up above the water and making for some great photos with my pink kayak. On one of our days the winds blew so incredibly hard I decided to spend a large part of the day inside the rig knitting a luscious wrap that I have been working on for much too long. The sound of that wind was fabulous, and the clarity it brought to the sky was breathtaking. I loved it, even though it made it too wild on the lake to take out the kayaks or try to take a swim. I completely finished reading a great book about cheese, and Spain, and slow food, and betrayal. It was written so well that I had to highlight phrase after phrase of beautiful words to remember. I highly recommend “The Telling Room”, by Michael Paternini. Reading that makes me feel like I have read something worthwhile is great. We even had time for watching a couple of movies in the evenings, with the inverter handling it just fine without having to run the generator. I laugh to remember that we had this rig for several years before we knew it would do that. Finally on our second to the last day, the wind died down completely, and I managed to slip into that crystalline water for a great swim. Cold, but great. Barbara and Ansel came down the hill to join me, but neither one of them could manage to get all the way in. I probably wouldn’t have stayed in as long as I did if I hadn’t been trying to convince them to swim with me. The day heated up beautifully, but with the warmer temperatures and no winds, before long there was a bit of smoke in the air again. Nothing like Grants Pass a couple of weeks ago, but smoke nonetheless. On our last morning kayak, we took our slow time meandering around the lake. While admiring the old historic cabin on the southwest shore, the owner came down to the shore to visit with us. I must say I haven’t had such a busy social life in a very long time! He regaled us with stories about the cabin, built in 1928 by his wife’s father who saved the life of the original owner of the property. When asked what he would like in return for saving his life, the man said, “If you ever sell the property, sell it to me”. Sure enough that is how he got it. Now there are three sisters who share the space with extended family who have memories of staying there as girls in the 1940’s. They live there 3 months out of the year and then return to Morro Bay in California. He told us that the first trout were brought to the lake on mules in 1880 and by the 40’s there were huge browns in that lake that the girls remember catching. In the 60’s however, chubs were winning, and the Fish and Game decided to kill the lake and start over. Now the fish that are planted each spring are fairly well fished out of the lake with no big old boys left. The deepest hole in the lake is about 150 feet, but the rest of the lake is quite shallow. It was great to get local stories from the local folks. He even said we were welcome to hike up behind his place to Brownell Meadows but we will have to wait for the next trip to take him up on the offer. Besides, this was the camping trip for doing nothing and we were getting a bit carried away with all the somethings that we were doing. When it was time to leave, once more the campground was very nearly empty, with only a few occupied sites even over in the busy Medicine Campground. Our Hogue camp was almost completely empty. How often can you find an empty campground on a lovely lake in the middle of August!?! We read on the campground sign that there was an RV dump nearby but turned the wrong direction and ended up going south on 49 instead of where we were supposed to go. As many times as we have been to Medicine Lake, I still needed to get out the map to be sure we were on the right road heading home. Down from the Highlands, summer set in again, with temperatures rising ten degrees in as many miles and smoke thickening the air as we approached Klamath Falls. bummer. At least we got a nice break from it, and Rocky Point has enough thick forest to help oxygenate the air a bit. I just read that Janna and Mike tried to see Crater Lake this week. Such a bummer and bad timing. I an only imagine how disappointing it must be for folks who travel from all over the world to see the beautiful lake and its gorgeous blue. Ah well, Medicine Lake isn’t quite as blue, or as big, or as dramatic, but it was lovely and perfect and I am so glad that after five years we finally took our Medicine. Medicine is a word of several meanings. As in, Take Your Medicine, or more beautifully, This Place Has Powerful Medicine. Medicine Lake is named for the second meaning, the sacred meaning, but the two seem to overlap here in the deeper meaning of healing, either body or spirit, and of course, both are connected. Medicine Lake is a small lake in the bottom of a 4 by 7 mile caldera on the Medicine Lake Highlands near the Northern California border. This sweet little lake is just a couple hours drive from Klamath Falls, and yet I don’t often hear of people from Klamath traveling here. Most of the license plates are from California, with folks driving up the nice paved two lane road from Mt Shasta. It is a bit of a drive, off the grid entirely, so perhaps that accounts for the open campsites and quiet lake. There are no hookups here, no cell phone service, water in the campground but not at the sites. We came ready to boondock for six days, with a full tank of fresh water and empty waste tanks. Generator use is allowed in the campground from 8 in the morning to 10 at night, but we tried to be considerate and except for one early evening movie when the campground was nearly empty, we only ran the generator for an hour or so in the morning to keep up the charge. We were careful and when we left, our tanks still had plenty of room to take on the extra six gallons of water we added with jugs and a funnel. Mo has a small solar panel and although it doesn’t support heavy use, it does keep the charge up throughout the day. Medicine Lake Highlands has the distinction of being the largest volcano in the Cascades and the largest volcano in California. Unlike the dramatic peaks we are all so familiar with, Shasta, Lassen, Mt Hood and others, this volcano is a broad volcano with dacite and rhyolite lava and obsidian flows as recent as 1000 years ago spreading from the shield volcano for more than 30 miles in every direction. From Klamath Falls, the Highlands can be seen in the distance to the south, unassuming, appearing as a nondescript broad plateau. Medicine Lake Highland’s volcanic area exceeds 200 square miles in Modoc and Siskiyou counties and encompasses portions of three National Forests including Modoc, Klamath and Shasta-Trinity. Over the last half-million years, volcanic eruptions on the Medicine Lake shield volcano have created a rugged landscape dotted with diverse volcanic features including more than 700 lava tube caves. Some of the most popular features include Glass Mountain, Burnt Lava Flow, Medicine Lake Glass Flow and Undertakers Crater. Medicine Lake has no known outlets yet the water remains clean and clear with inflows only from snowmelt, rainfall and springs. Driving south from Klamath Falls through Merrill, home of one of the best quilt shops in Oregon, Tater Patch, we continued into California on Highway 39 to Alturas, turning west toward Tionesta 40 miles or so south of Tulelake. The road to Medicine Lake is well marked, but narrow, paved but very rough. Abby and Jeremy complained quite a bit about the thumping, bumping rough sounds of the regular seams across the road. I guess they are created to prevent frost heave on a road crossing soils thick with pumice deposits. The road rises over 20 miles or so from the juniper sage desert at 3900 feet to high red fir and lodgepole pine forests at nearly 7000 feet elevation. We watched the temperatures drop from the mid 90’s to the high 70’s as we drove. The skies were clear and gorgeous, with just a bit of smoke from the California fires marring the blue. In the past few years, we have planned trips to Medicine Lake, changing our mind at the last minute because of fires and smoke. This time we decided to go anyway, because fires and smoke in the west seem to be a constant and if we wait for no fires, we may never get back to this favorite little place. We decided to skip the tow car on this trip, instead hauling the boats and bikes in a small trailer. We have traveled here several times, and spent days wandering the forest service roads exploring lava flows, obsidian flows, and taken in the views from the high mountain fire lookouts. This time we intended to relax completely. Without the car, we wouldn’t be tempted to wander any farther than we could go on a bike or our own two feet. We arrived on a Tuesday afternoon, to find one of our favorite sites wide open. There are three main campgrounds at Medicine Lake, with the first one a bit more open and a sign says not suited to larger rigs. We aren’t quite sure what that means, because the sites are quite large, but the road is narrow. The sites are also not even close to level. We could camp there in a pinch, but the second campground, Hogue, is our favorite. There are a few sites in the upper part that can accommodate bigger rigs, but our favorites down by the lake are a bit small and not level. Medicine campground is the third one in, usually busier with lots of room for larger rigs. The Headquarters campground is farther west on the gravel road beyond Little Medicine Lake, and is very quiet, open and usually empty because it is a bit of a distance from the lake with no lake views. Another place that would do in a pinch if you drove a long distance to camp and there are no reservations here. Our site 45 has a gorgeous view of the lake, a nice big picnic table down the slope from the rig, and for some reason there are two additional rock firepits added to the big one that was here when we camped last in 2008. A rocky trail leads down to the water and with a bit of maneuvering, we got the boats down to the shore where we could leave them safely for the duration of our visit. We settled in for a great afternoon of watching the water, watching the sky, playing cards, and I brought out a decidedly sinful and delicious supper of old fashioned hot dogs, baked beans and potato salad that I made the day before at home. The site has only a small drawback. It really is a bit more suited to tent camping than a rig, but we managed to get the MoHo leveled and pulled in far enough that the back end was off the camp road. It is times like these that we are grateful for our perfect length of 26 feet. We can fit most anywhere and yet still have enough room to travel comfortably for weeks or months. Our sleeping area looked out over the camp road, but there was no one in the site across from us, and the road was quiet, so it wasn’t a serious problem. The night was completely silent, the moon was low and reflected on the lake and the stars were brilliant. I wondered momentarily about the next several days. No internet, no phone, no car. Just a book, a boat, a bike, and a chair. Ahhhhhhhhh. I am writing this post in late August, the 22nd actually, and a large thunderstorm has just passed over the east side of the Cascades. We don’t often get moisture this time of year, so it was a surprise, lovely and luscious and more than a little bit scary. Hopefully there is enough rain in the storm to offset any chance of lightning strikes starting more fires. The temperatures have dropped considerably this afternoon, and I had to actually put on a pair of sweat pants. The month of August seemed to fly by, and somehow one of our favorite little gatherings slipped by without even a mention. For the past 11 years, Klamath Blues Society has hosted a Brats, Brews, and Blues Festival at the Pelican Marina in Klamath Falls. It usually runs from early afternoon to about 7 in the evening, with local blues bands on the venue for some delightful entertainment. The bands come and go and are at various levels of excellence, but for a small out of the way town like Klamath, it is still great fun to go listen to music on the shore of the lake and pay 20 bucks for a bratwurst and 6 beer tickets. Each of those tickets buys a very small sampler of beer. but It's all for a good cause, with proceeds from the event go to Camp Evergreen, a youth bereavement camp run by Klamath Hospice for children who have lost loved ones. A couple of local breweries are there to peddle their wares and this year the midges were absent and the weather was perfect. This year the event was in early August, and for once, Mo and I weren’t off traveling somewhere. Even more perfect, my daughter Melody and son-in-law Kevin were the emcee’s for the event and my daughter Deborah now lives close enough to join us for a great afternoon. It was sooo much fun. We ran into our neighbors, Wes and Gayle, who enjoyed the event as well. Not as much as I did though, since I had my daughters there to get me up out of my chair and dancing. Once I started, there was no stopping. I would try, but then that dang beat would keep me going and laughing like crazy and trying to keep from falling on my face, I just kept on dancing with my girls. Haven’t had that much energetic fun in a very long time. The other summer doings around here have been a bit less delightful. Our giant ponderosa pines have very long needles, lots of them, and every summer it is a big job getting them off the roof. Mo is the ladder climber in the house, since I get wobbly and goofy up there. I can do the roof part, but that part where you get from the ladder to the roof not so much. I watched her up there, holding the ladder for her ascent and helping jockey the blower cord around so it didn’t get in the way. Other excitement around here has been even more subtle. I have been watching flowers bloom and trees grow while Mo mows. She built this place a year before I knew her and I was comparing some of the photos of what it looked like in 2002 and what it looks like now. It is so much fun seeing tiny little trees that were a foot or so high now reaching for the sky at more than 30 feet. Something has “grabbed” in the last couple of years and everything is growing like crazy. Starting to look like a jungle out there in spite of the challenging climate we have here in the mountains. Somewhere toward the end of July we traveled a few miles east to the Running Y Resort for their “big” garden tour. One of the gardens there was carved out of all that rocky basalt with an incredible amount of work and planning. She won “gardener of the year” for some sort of statewide thing, and said she was amazed that she won over some of those lush Portland landscapes. We drove through the resort roads from garden to garden, marveling at the variety of stuff that could be grown in a dry rocky landscape. I also thought that I should have a garden tour of my own! Instead, when the kids come to visit, I just take them on the “garden walk”, telling them how things are doing and what is what in my Rocky Point landscape. I still have issues with the deer, spraying the very smelly Liquid Fence at least every two weeks to keep mama deer and her babies out of my flowers. When we got back from the last trip she had nipped a couple of flower heads off the rudbeckia sunflowers, a plant I thought deer didn’t eat, but she hadn’t touched anything else. Next door at Wes and Gayle’s, she even ate all the herbs on the porch. I didn’t think deer liked strong flavored herbs, but I guess since all my flowers tasted like rotten eggs and old milk she figured something was better than nothing. Go me! Sorry, Gayle.